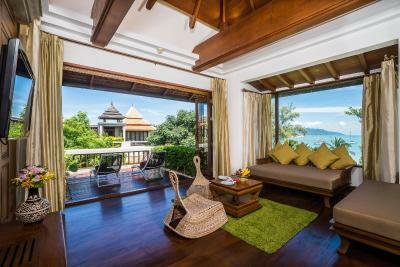 Lock in a great price for Royal Muang Samui Villas – rated 8.6 by recent guests! 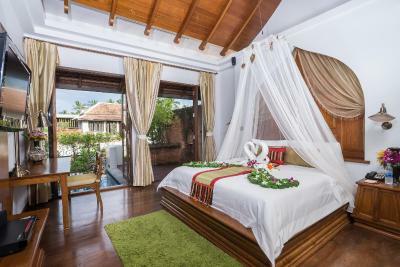 We stayed in the pool villa with sea views and the room and facilities were lovely. Our room overlooked the beach and had a private pool and sun balcony to relax in private. The bed was very comfortable and the room sizes were very spacious. Like a home away from home. The spa in the en-suite was also excellent. The breakfast was very nice and there was a very good selection which changed each day. The staff were very friendly and extremely helpful and attentive. Great hotel pool!! The scenery is gorgeous. 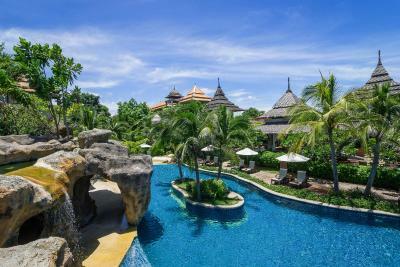 We had a private pool villa that was a minute walk to the main pool and beach area which is really nature at its best. 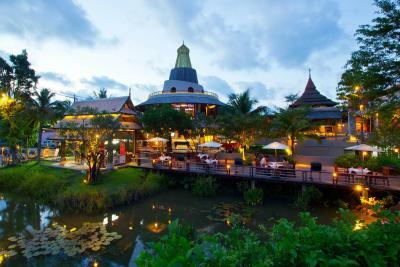 The staff were kind people and the peacefulness of the resort matched the approach of the staff. Special thanks to Gandi, Boy, Mauen, Boo, Than and Ball and all the other staff that we’re great. The spa was also very relaxing and we loved the massages. The Hotel location is perfect for relaxing. The beach was metres away from the hotel and it was perfect for both adults and children. Breakfast was good and the staff at the hotel were the best I have ever met. The front desk staff were very helpful and made recommendations for places to eat. We used the hotel luxury vehicle to take us into chaweng and also to the airport and the prices were the same as a local taxi. 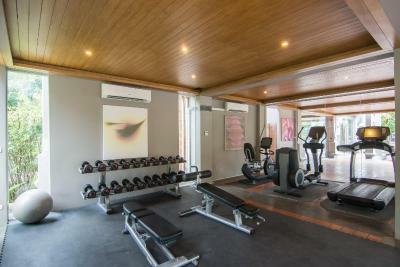 Check-in, breakfast, pool, rooms,close to the airport,main town. The breakfast and the restaurant was really good, staff was kind and helpful. The beach should be quiet and pleasant usually. 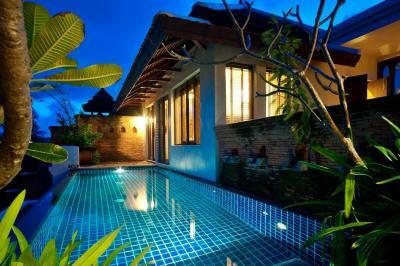 Highly comfortable villas. Highly green and authentic. High level of guest relations. very good breakfast, very high level of service. Transfer to the downtown. There are some mosquitos around but quite normal in such an environment. 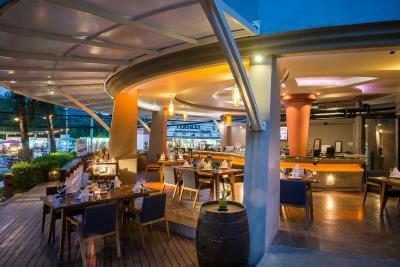 The staff was very kind and lovely,the room was very good and the food was great. Amazing stay, perfect location Buffet breakfast was great, huge array of cuisines. The beach this place was on, was stunning - much quieter and more beautiful than the main beach of Koh samui. Highly recommend! 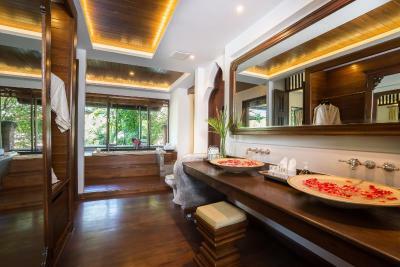 Royal Muang Samui Villas This rating is a reflection of how the property compares to the industry standard when it comes to price, facilities and services available. It's based on a self-evaluation by the property. Use this rating to help choose your stay! 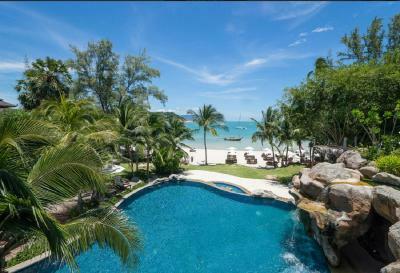 One of our top picks in Choeng Mon Beach.Located on the white sands and clear waters of Choengmon Beach, Royal Muang Samui Villas offers rooms, villas and pool villas with free WiFi. 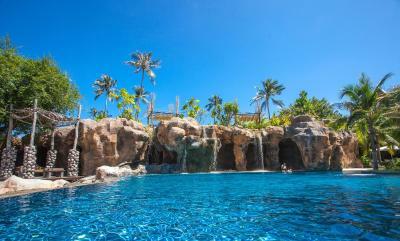 This beachfront property also features an outdoor pool and 24-hour front desk. 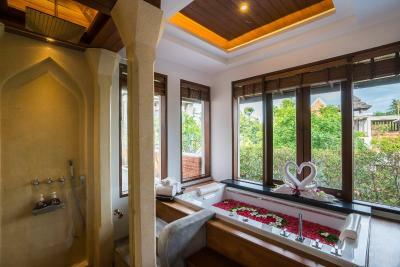 Suites and pool villas feature an LCD television, CD and DVD player and private bathroom with a large spa bathtub. Room service is provided. 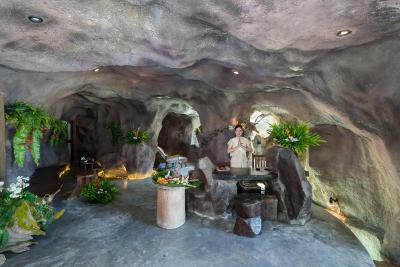 Guests can experience aromatherapy and a variety of treatments at Cave Rai Ra Beach Spa. Other facilities include a fitness center and a tour desk. 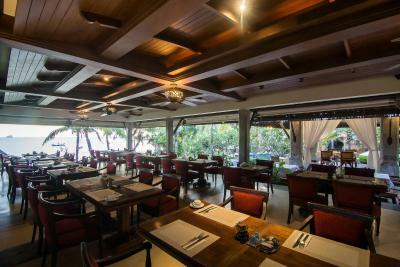 Samui Sailor Bar & Grill serve Thai and Italian favorites with fresh seafood. 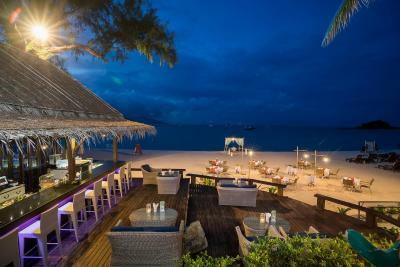 Guests can enjoy wines and cocktails at Spice Beach Restaurant. 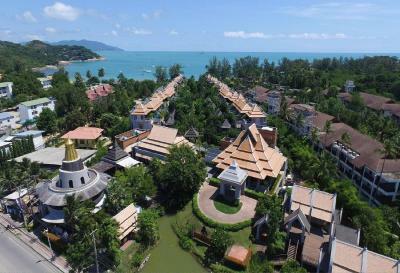 Royal Muang Samui Villas is a 10-minute drive from Chaweng's shopping and nightlife area. 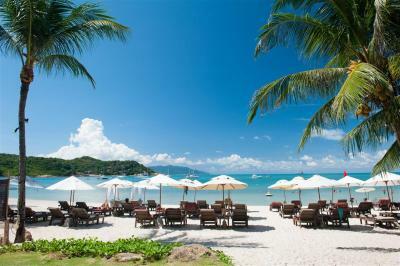 Bophut, Big Buddha Beach and Maenam are nearby, while Samui Airport is a 15-minute drive away. 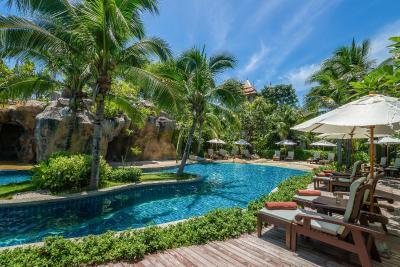 뀐 Located in the top-rated area in Choeng Mon Beach, this property has an excellent location score of 8.8! 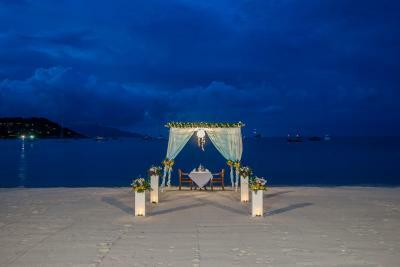 When would you like to stay at Royal Muang Samui Villas? 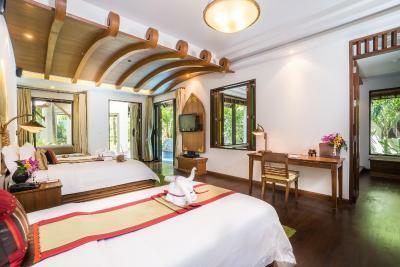 Located on the ground floor, this spacious suite in contemporary Thai style decor features a private pool and an outdoor terrace. The private bathroom comes with a whirlpool bathtub. 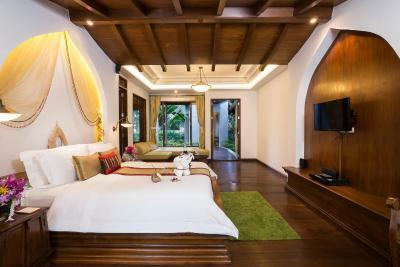 Located on the 3rd floor, this spacious villa features a private swimming pool, an outdoor terrace and views of the garden. Guests also have access to a living room, a kitchenette and a dining area. 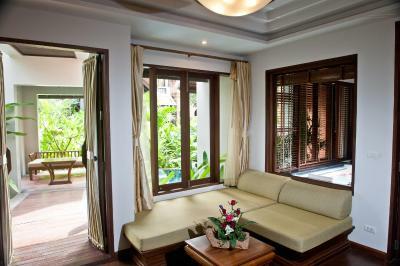 Located on the 2nd floor, this air-conditioned suite offers a balcony overlooking views of the garden. The private bathroom comes with a whirlpool bathtub. 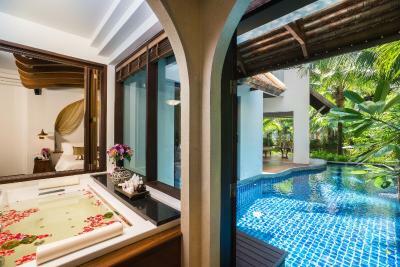 Located on the ground floor, this family suite comes with a private pool and an outdoor terrace. The private bathroom comes with a whirlpool bathtub. Located on the 3rd floor, this family room contains 2 separate bedrooms and 2 bathrooms. 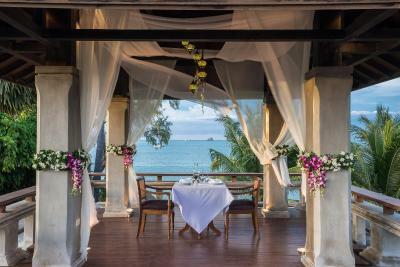 Guests have access to a private pool and an outdoor terrace as well as a kitchenette fitted with a dining area. The private bathroom comes with a whirlpool bathtub. 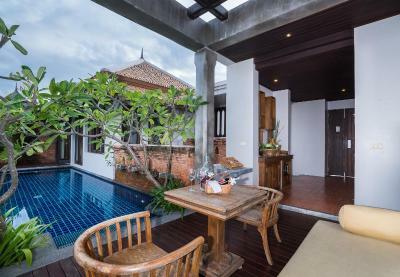 Located on the 3rd floor, this villa features a private swimming pool and an outdoor terrace with dining area. Guests have access to a spacious living room and a kitchenette. The private bathroom comes with a whirlpool bathtub. 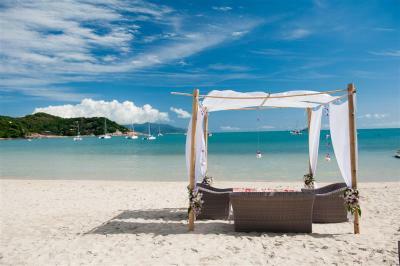 It is a natural paradise away from the crowded world and within a pure and unspoiled environment of greenery, white sand beach and crystal clear sea that suits vacationers looking for a peaceful and romantic holiday haven to relax and rejuvenate..
House Rules Royal Muang Samui Villas takes special requests – add in the next step! All children under 12 years are charged THB 1200 per night for extra beds. 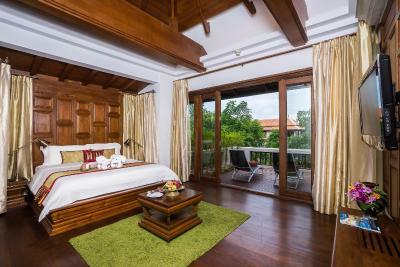 Any additional older children or adults are charged THB 2400 per night for extra beds. 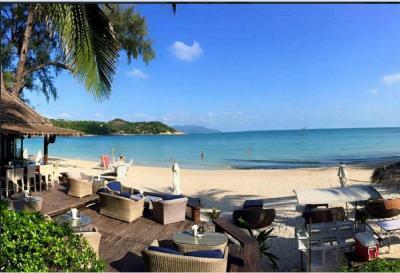 Royal Muang Samui Villas accepts these cards and reserves the right to temporarily hold an amount prior to arrival. 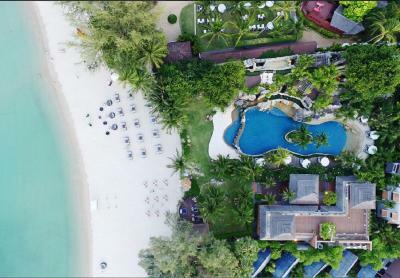 Please note that the name of the credit card holder must be one of the guest's name and credit card must be presented to the property upon check-in. Please also be informed that the property will strictly not allow guests to check in if the holder's name of the credit card used during booking is different from the guest's name. For bookings made from 2 April 2018 onwards, a compulsory Gala Dinner is included in the room rates of 31 December 2018. The rates of the Gala Dinner are based on room type and occupancy (guests sleeping in extra bed will be charged separately). Everything, except the private swimming pool. The amount of mosquitos and no mosquito net provided in the room was the only criticism. Apart from that everything was absolutely amazing. How friendly the staff were. Room was exceptionally clean and the style and decor of the room/ all of the hotel was beautiful ! The breakfast every morning was outstanding ! Something different on the menu each morning so there was good variety. There wasn't a lot of English speaking guests so we found it a little isolating in terms of meeting new people. Also it is best to watch the bar staff during happy hour at the bar as your cocktails really don't have much alcohol in them. We found if we went to the bar and watched the staff they would do a proper pour but if you had it delivered they were very weak. The hotel was very nice, rooms were well appointed and spacious. Pool was beautiful and beach was clean and very relaxing. We were on our Honeymoon so this location suited us nicely away from the hustle and bustle. It is rather expensive and I have stayed really nice places for a lot less so I’m not quite sure it is good value for the Money but That might just be me. Lovely place, nothing wrong with it. Beautiful apartment, Best breakfast buffet I’ve had. Sweet staff, they gave my baby some toys for the Beach and played with him. He loved it. The private pool is such a luxury and the bigger pool is a lot or fun! 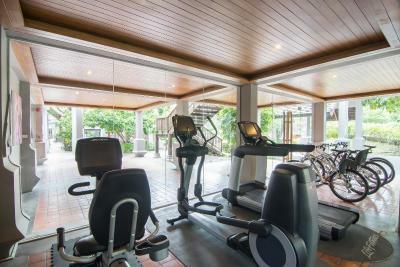 I would say that the Gym facilities must be improved. 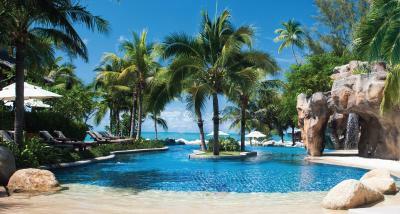 This is a first class resort, the staff is the best. The beach is super, clean clear water. We had the best 8 night and will be back. Staff were always so happy and kind. Really felt very welcome. The only cons I have and it’s not really directed at the hotel but although the location was perfect if considering the beach only, since taxis are so expensive compare to all the rest, traveling as 2 person back and forth anywhere will cost 400 BHT one way which is equivalent to £20 back and forth. If you want to get to the centre every day or more then once a day it will sums up to a lot of money. We declined renting scooter since we have no experience in riding it, so if you do decide to rent one this problem is solved... otherwise, I would probably book the sister hotel which is more central because in the evening there is nothing to do around the hotel or in it. The hotel was amazing. The room was very specious, beautifully decorated and very big. The bed was one of the most comfortable beds I slept in. The staff were extremely friendly and helpful. We stayed for 10 days and I find it hard to leave (writing on the plane). The beach is perfectly clean and only few steps from restaurant, it has comfy beds and sofas to laze on, you can find corn on the cob, ice cream and all kinds of vendors on the beach. 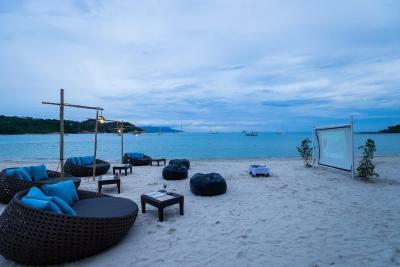 If you stroll on the beach you will find loads of massages from 300 BHT for foot massage etc. I can not recommend since I had a massage in the spa. The hotel Spa was also amazing. The treatments that we had were really good although the average price for a massage at the hotel is 1800BHT but I think it’s worth it. Breakfast is very generous although it is hard for us to eat curries in the morning...overall we found that we were not that hungry and felt it was a waste.. 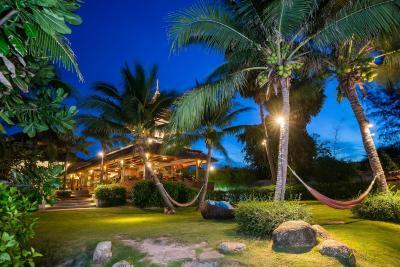 Very comfortable, luxurious, friendly beautiful place! I would recommend it all heartedly. Special thank you to Treenah, and Nui, the most helpful and efficient staff members who made this stay make us feel so welcome, at ease, safe and home! Nico who tried to do the best he can to change our flights, and last but not least Ghandy, fun, loving, smiley happy guy, who is always there to help if needed. Hot water just lukewarm sometimes. 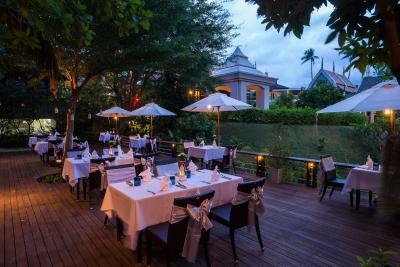 We had a pleasant experience at Muang Samui. The location is the best on the island to us. 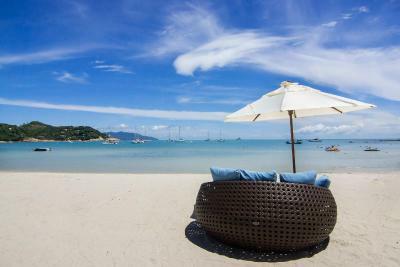 Choengmon has the finest sand among many beaches on Koh Samui and it’s not as crowded and noisy as Chaweng. Waking distance to Family Mart and 7-11 and many restaurants from our room. Hotel provides free shuttle bus to Chaweng everyday. The staffs are very kind and attentive. They helped us rescheduled our reservation. When we arrived at the hotel, the neighboring property on the east side was under construction, the staffs at reception changed and upgraded our room to a west side 3rd floor en-suite. 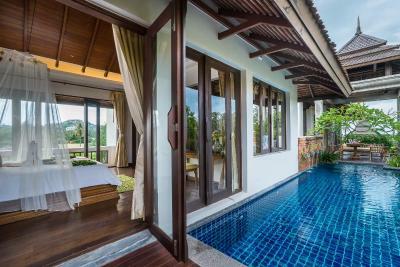 The private pool on the top floor provides more privacy. 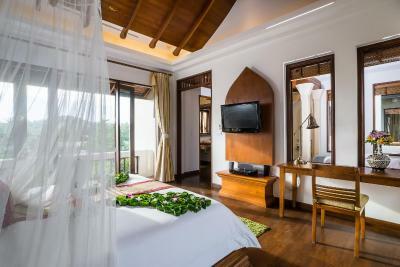 The suite is spacious with separate bathrooms, a living room, a pavilion and sunny balcony. 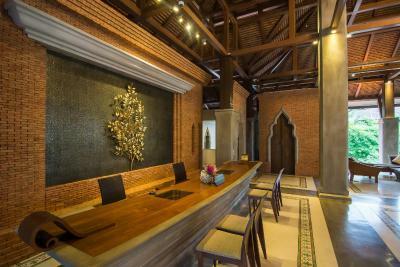 We love the classic Thailand style decoration. A little fun staying in the room is that the inner doors are locked by bars. Breakfast is well selected and delicious. The hotel provides several free sports on the sea. We played the canoe. There are several patches of coral reefs in front of the beach. You can see fishes when you roll the canoe over the coral during ebb-tide in the afternoon. 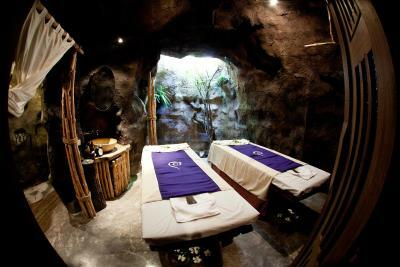 The cave spa is also recommended. 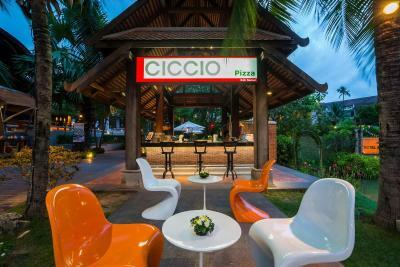 Family villa rooms were to far away for young kids Breakfast caters for Asian customers to much Property’s on either side of the resort are not nice. A few things didn't work. The spa jets in the private pool needed to be fixed (air switch) and the microwave was broken. The hot water was only luke-warm and didn't work at all in the en-suite. But the staff attended to these issues immediately and fixed the air switch and replaced the microwave. Thankyou to all staff - you were lovely! !